2008 past away as the speed of light! Everything went so fast and so many things happened, but now it's time for my daddy to have some rest and spend some more time with me. I'm running behind with my blog posts! That session was also the start to meet all the other APEX enthusiasts. 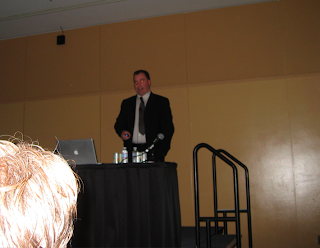 Later that afternoon I went to Tom Kyte's keynote about The Best Way. I always like to hear Tom speaking. Basically he said that it depends circumstances what "the best way" is and that "the best way" can change over time, which is ofcourse, very true. 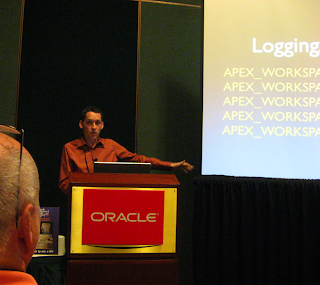 On Tuesday it was John Scott's turn to talk about APEX Best Practices. Especially after Tom Kyte's presentation this was a great presentation ;-) To be serious, the best practices, or hints and tips that John talked about I don't think will change that quick over time. To name some of his best practices: not everybody need to login as an admin, use bind variables, use page comments and locking etc. So great things to follow I would say. Later that afternoon I went to see Marco Gralike with his presentation about XMLDB. Marco is very knowledgeable about XMLDB and I strongly believe APEX and XMLDB can work nicely together. For ex some of the techniques are used in DG Tournament or the APEX Blog Aggregator. 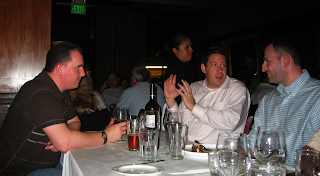 Later that day there was a Tools debat about APEX, JDEV and Forms. The product managers of Oracle were in the panel: David Peake for APEX, Duncan Mills for JDEV and Grant Ronald for Forms. It was a relaxed chat about the different products and to be honest I'm not against any of the products. I think they all fit in an environment and can even work nicely together. One of the messages was that Forms is supported till 2017! So why would you migrate if Forms is still doing everything you need? But if you are looking for something else you can migrate to APEX or JDEV. We (Apex Evangelists) don't tend to do a full blown migration at once, but a softer approach where both environments work together for some time. So far that works well for our clients. I'm not sure you knew, but in the past I also developed in BC4J (around 2003) and I must say things in JDEV land have changed quickly. At that time I found it hard to decide which UI to choice (BC4J, UIX etc), but today it seems JSF is the way to go. I found the talk very interesting and definitely something that would fit in every conference. My last session of the day was from Sue Harper about Developing with SQL Developer. This was more one of an introduction where she covered a lot of different things you can find in SQL Developer. But I promised myself to do another post about that and the nice integration with APEX. I'm going to try to do another post about the other sessions tomorrow. Carl Backstrom had a car accident on Sunday and passed away. It's unbelievable, I wish it wasn't true! What do you need to say? How do you need to react to such a thing? I'm very sad, it's very painful, it's a great loss... He was such a nice guy and a good friend. My thoughts are with his family and friends. 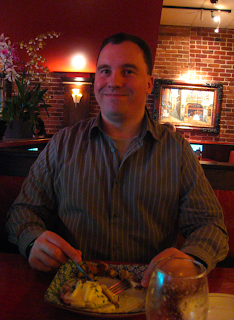 Carl was one of the key developers in the APEX team. I liked to call him "Mister AJAX", as he was so strong in all the fancy web stuff. He was one of the persons who gave us the Interactive Reports in Oracle Application Express. He still had so many plans to improve APEX and make it even nicer. Carl had a nice blog, an excellent APEX example site with lots of web 2.0 features and he was a frequent poster on twitter. But next to all his good work for APEX, I would like to remember Carl as a great friend. When you were with him there was always something happening. 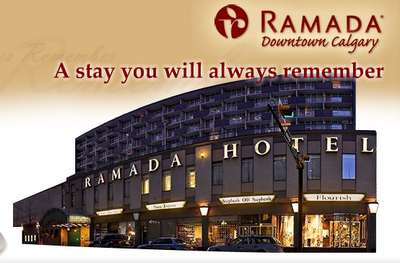 He had great stories, he liked to go out and have fun... He was an exceptional person who was always willing to help others. On the picture, taken at the APEX Meetup, Carl is they guy with the biggest smile on the left. Carl thank you for everything, I'll miss you. 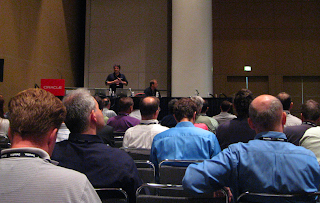 In the last years the number of APEX presentations at ODTUG have grown every year. For 2009 we plan to have even more! The ODTUG board asked John Scott, Scott Spendolini, Patrick Wolf and myself to be responsible for the Application Express Track content at Kaleidoscope 2009. 2009 will be a bit different, as we'll have our own APEX track. It will be even easier to find all the APEX presentations as they will be held in the same room, possibly two! The content of the next conference will also be decided on what YOU want. Make your Mark - You can shape the direction of the ODTUG Kaleidoscope conference by discussing and voting on topics in our new online Kaleidoscope Community. Tell us what you know you need to learn. You have ideas and we want to hear them! Submit an Abstract - Don't wait until the last minute (abstract deadline is November 3), submit your abstract now. Not sure what to present? Begin participating in the Kaleidoscope Community and find out which topics are important to developers today. The last couple of weeks the blogger sites didn't get updated in the Apex Blogs aggregator. Apparently the site is getting popular as I got a lot of mails to tell me. The problem was the comments were not retrieved due to a change somewhere in the xml. As a quick fix I don't try to get the comments anymore, but at least you should see the new blog posts again. Once I've more time, I'll update the packages again to retrieve the comments as well. I used a backup to bring back all posts and updated from there, so all APEX posts should be there. I realize I didn't blog about it yet, but some months ago I created also an APEX SIG group on Linkedin. There are currently over 60 members. Linkedin is an online network of more than 25 million experienced professionals from around the world. Already a lot of ICT people have a kind of curriculum vitae there and are linked to others. 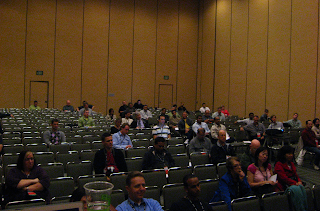 On the last day of Oracle Open World I followed one session. 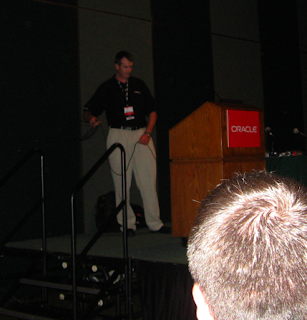 At 9 AM John Scott presented Dispelling Myths About Oracle Application Express. I really liked this session as it started differently, the topic is hot and he made use of some nice visual effects like a 3D Timeline and some nice videos. The session answered the most common questions we get in the APEX community, especially from people who doubt the power of APEX. Is APEX new? Is APEX scalable? Is APEX web 2.0? etc. I hope John will do this presentation again on some other events as I think it's a must seen presentation! After having some Chinese food we went to the airport as our flight was already in the afternoon. The flight went well, although it stays a long flight, but I could sleep a bit. Back home I'm recovering from a good Oracle Open World. It was especially nice to meet people in real life again. After some nice breakfast with John I went to my first session of the day. 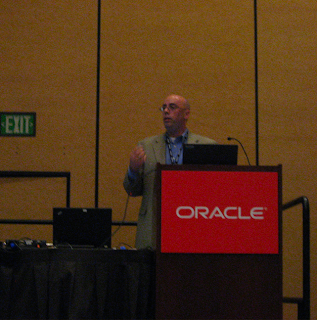 Mark Drake talked about "Oracle Application Express and Oracle XML Database: A Match Made in the Database". I really enjoyed the session as I think the possibilities of both technologies can work very nicely together. Mark and Carl made a document management system in APEX based on the XMLDB technology. I found it an awesome product. They will make it available in the next days/weeks. I'm using some of the functionalities of XMLDB in Apexblogs.info. Afterwards I had some lunch and prepared to go to the Keynote with Larry Ellison and Mark Hurd of HP. The queues were enormous! 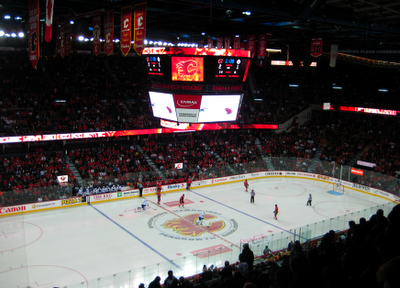 I already blogged about the keynote, so I'm not going to do that again. This OOW is strange. Normally I bump up to the people I know and attend the other big Oracle conferences, but this time it didn't happen. 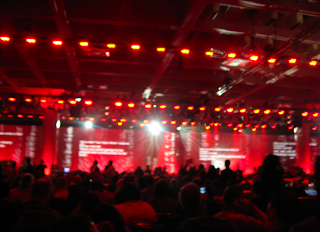 Maybe because now there were sessions in a lot of different buildings (Marriott, Moscone South, West and North). Tim Hall, Eddy Awad, Lewis Cunningham, Doug Burns etc. I'm still waiting for some pictures that John took as for once I left my camera in the hotel. The party was really nice and there were some fun things to do next to the concerts. Another area I was interested in was the new SQL Developer Modeling tool. Apparently the tool will also be released as a seperate product. Basically Oracle bought Ikan's software, CWD4ALL. I know some people at Ikan as it's a Belgian company. It was always nice to see them on events, so now some of them work for Oracle was a nice surprise. 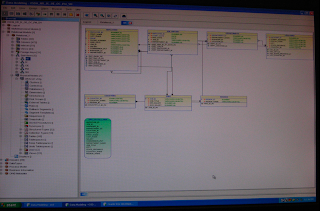 The romours are that the modeling tool will be a paid option for SQL Developer or you can buy it as a seperate product. The demo I saw was quite impressive. Thanks Rene! 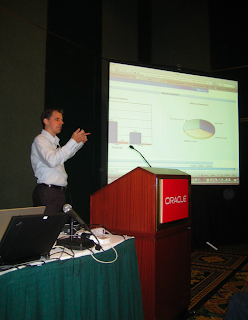 In the afternoon I saw a presentation of Patrick Wolf, The Power of the Oracle Application Express Repository. I really liked this presentation as he touched different areas of the APEX repository. Patrick compared the APEX repository with the Garden of Eden and played some nice relaxing music with that thought. Tuesday evening was fairly busy as I had two parties at the same time. 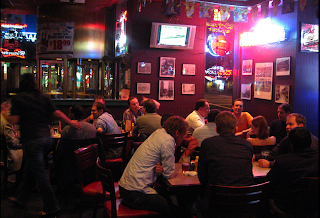 I first went to the Benelux evening, had some drinks, food and nice chats with people from Belgium and the Netherlands. Then I had to run to the next event, the APEX Meetup. Around 30 people joined us during the evening and we had talks about APEX and other things. It's nice to also know more about their situation at home, family, region they live in etc. The keynote just finished. Larry Ellison announced Oracle is also providing hardware together with HP. 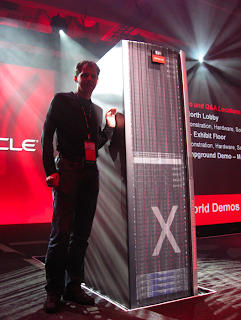 If you want the worlds fastest machine for the Oracle database you should buy Exadata! I got up to the stage and talked about it to Larry and he gave me one of these nice machines as a present! Thanks Larry! On Monday at 11.30 I gave my presentation about Charting in Oracle Application Express. I tried to build things up, so beginner and more advanced users would learn something. The room was pretty full, around 70 people I think. I talked why you would like to use charts, how to create and adapt them and how they work under the hood. Paulo already blogged about my presentation. At the end of my presentation I talked about other charting possibilities if APEX doesn't fit all your needs. I was very proud to publicly announce the partnership between Apex Evangelists and Anychart. I'll do a proper blog post about it, once I'm back from OOW, but it comes down that we'll provide you with an upgrade for your APEX environment. 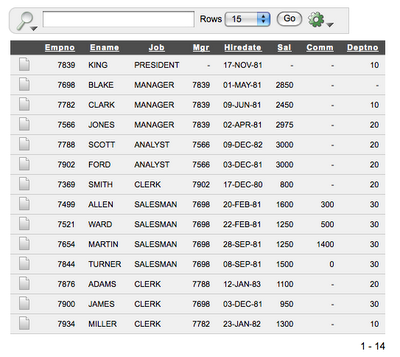 It will allow you to profit from the nicer look and feel and more possibilities in Anychart 5.0. 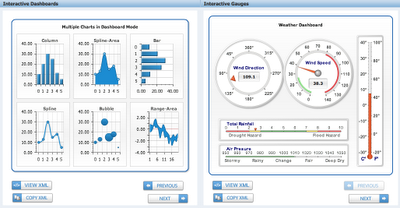 Next to that we'll provide consultancy to guide you to create even nicer charts like Interactive Dashboards, Gauges etc. More information about that will follow next week. At lunch I had a meeting to discuss more things we could do for the APEX community and the upcoming events like Kaleidoscope. 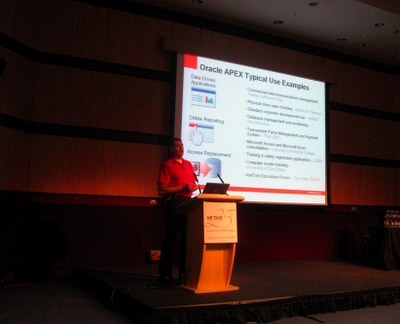 In the afternoon I went to David Peake's session about converting Oracle Forms to APEX. The room was very full, lots of interest in this... Earlier I created a video about the migrations tool, but in the meanwhile the look and feel has changed. It's even easier to see and search how the migration went. The tool is not intended to give you a silver bullet to do a complete 100% migration from Forms to Application Express. Instead it's a conversion tool that allows you to give you a headstart and guide you through the complete process of the Forms convertion. I got a lot of comments on my previous blog post about the tool, but I still believe it will a killer feature and the logic migration path if you're looking into something to replace your Oracle Forms because your business require it. If your Forms still fit your need, you don't need to convert of course, as the process you need to handle as a real project and it's not something you'll do in a day. Didn't have the time yet to finish the blog posts of the other days, but hope to finish that later today. On Sunday I started with the APEX - Ask the Experts panel. Ohh and... David said that APEX 3.2 will come out "soon" and an Early adopter "sooner" ;-) APEX 4.0 is planned for somewhere in 2009. I went to Tom Kyte's session about Schema Design and learned I should also look more into clustered tables. He didn't talk about ERD design, but more about which choices you have in Oracle design and why you should do certain things. I had the feeling he could talk a lot more about the topic and I also wanted to hear more about it, but time is limited at OOW. In the afternoon I had another session together with Rich Mutell, one of our customers to talk about an APEX case study. I just had to introduce Rich. He did most of the talking, which was great for me ;-) It was a very different presentation from others as he talked about his experience with APEX, but he's not really a developer, but a business user. 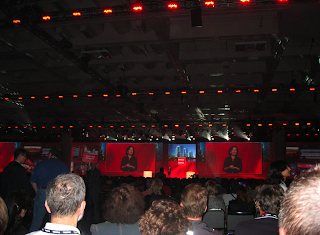 Next there was a keynote session with Safra Catz, mayor of San Francisco, Gavin Newson and an interesting talk from Washington's best-loved political couple Mary Matalin and James Carville. They entertain the crowd with a bitingly humorous look at the world of politics. Although I didn't get all the jokes and didn't understand everything it was quite nice to listen to them. As John didn't arrive yet (he drove from LA to San Francisco, a 10h drive!) I went for a small walk and recognized almost everything. It looks like I came too many times to the States (and San Francisco) now. At 7.30 PM I had a dinner with the people of the ODTUG Symposium. Scott Spendolini, John Scott and Mike Riley were also there. 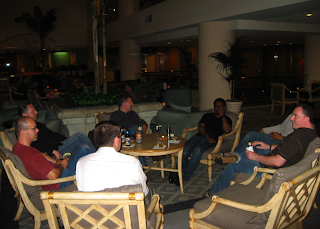 Later that night I bumped up to Marc Sewtz, Joel Kallman, Ashish, Raj and Denes Kubicek and had one last drink with them. Thanks guys for the nice evening. I just arrived in San Francisco. The flights weren't that bad after all. Actually the local flight from LA to San Francisco was really good! There was a steward called Tim and he was really funny. With the safety procedure he put humor into it and with success! For the first time I saw people actually listening to the whole explanation. He got a nice applause at the end too. Flying with Southwest airlines was a bit special, as you can pick your seat. I had position 5, meaning I could get into the plane as one of the first and had plenty of choice. Next to that I got a drink of the house. I'm currently in my hotel room, same place as last year, the King George hotel. I didn't get that much sleep yet and am awake for over 20h. In the plane I saw some good movies, one called "in Bruges", which I was surprised to see on the list, as it's a town in Belgium. I'm currently in the UK waiting for my next flight. It will be a long day as my first flight was at 7.25 AM from Brussels to London. My next flight is in 2 hours to LA. I first thought to drive together with John Scott from LA to San Francisco to see the nice scenery (coast drive). But at the last moment we buried that idea as people told us it would be a very long drive, especially at the time we would take off in LA. I called BA to change my ticket, but it would cost more to change the ticket from London to LA then the whole ticket (BRU-LHR-LAX + SFO-LHR-BRU) had cost! So I now end up to fly to LA and take a local plane to San Francisco. I'll normally arrive in San Francisco around 6 PM (SF time). Let's hope I don't get stuck in LA... especially when I read what happened to Tim! Some of you are maybe already on the way to San Francisco as Oracle Open World is just around the corner! San Francisco will look completely red and crowded with people affiliated with Oracle once more. I'll be one of them. 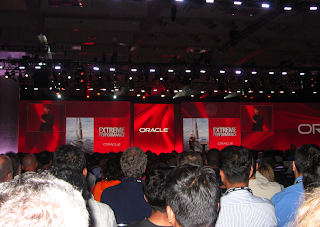 But I look forward to OOW'08. Meeting all other Oracle and APEX minded people again is always fun! As every year and on all big Oracle conferences, also this year we're organizing another APEX Meetup. 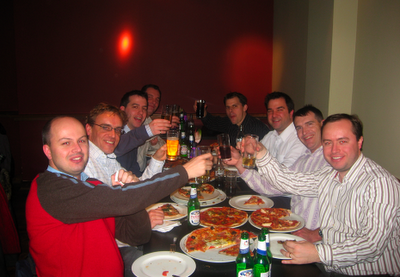 APEX lovers come together to chat about Application Express, work, the past and the future in a very relaxed atmosphere with some food and drinks. 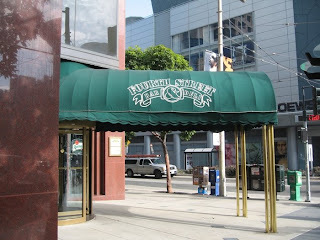 Just like the previous times at OOW we choose for the Fourth Street Bar & Deli place. You're free to join us on Tuesday 7:30 PM. Hope to see you all in a couple of days! 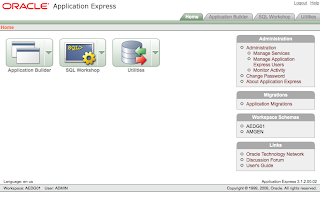 Oracle Application Express 4.0 will include a lot of nice new features. You can read about these in the statement of direction. 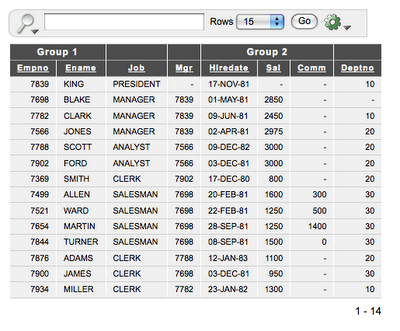 A few months ago I put some screen shots of the Websheets functionality on my blog. A better quality video can be downloaded in m4v format or swf format. APEX 3.2 won't include much changes in the development tool itself, but there will be a killer feature added: the Forms Migration tool. 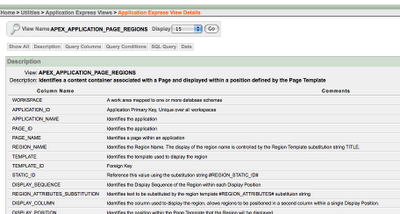 A lot of people are looking into other directions to replace their Oracle Forms/Reports or Designer environment. Till a few months ago Oracle themselves pushed you towards JDeveloper. A lot of people I spoke to were not that java minded and even started to look after other solutions (non-Oracle). With a Forms to Apex migration possibility I think a real solution is waiting for you. You want to keep your Oracle investments. APEX is living in the Oracle database so 100% ok.
You want to reuse your Oracle knowledge. 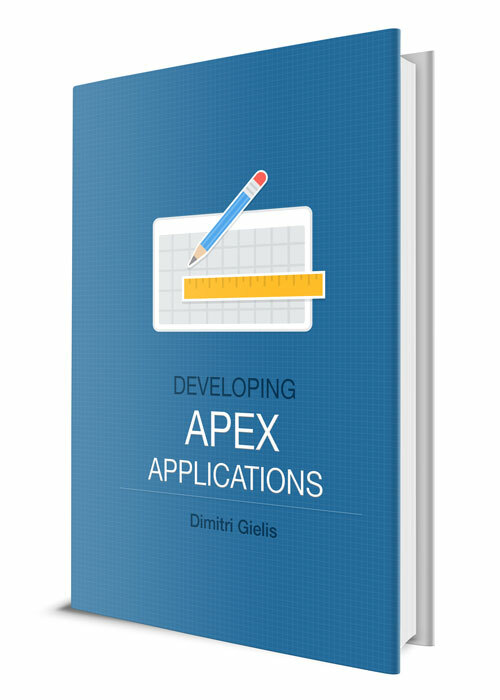 Forms developers know SQL and PL/SQL very good, which is exactly the knowledge you need for APEX. 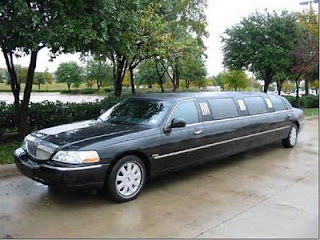 You want your migration be so streamlined as possible. Hopefully the Forms2APEX migration tool provides you with that. I don't believe a tool doing the migration for 100% automatically exists, but you should be able to reuse a lot and get a head start. You want your Forms environment in a Web 2.0 way, which APEX is providing you. As you could read on David Peake's blog, the limited Early adapter is not going to happen, instead a normal Early adapter is foreseen. 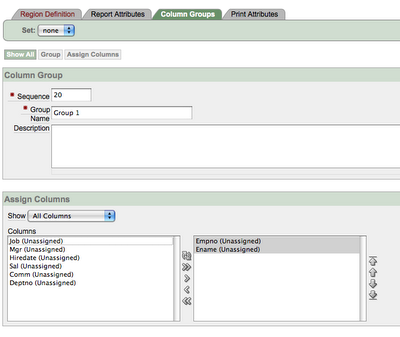 I'm not sure how the final screens will look like, but here's alread a preview of the Forms to APEX migration tool! I recorded this video from Marc Sewtz presentation for the German APEX Community. I edited it and added some music. When putting the video on Youtube the quality dropped, better quality video can be downloaded in m4v format or swf format. You might want to turn the volume down or up ;-) Hope you like it! You can see to the full presentation of Marc here (in German). 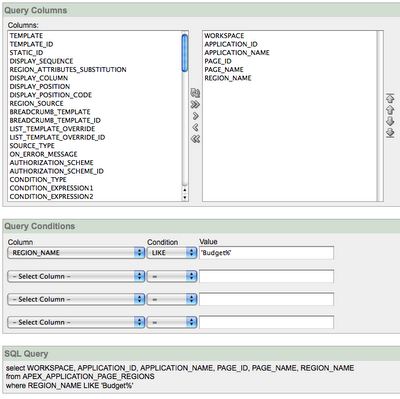 Free Oracle BI Publisher with APEX? Standard Support - Select this option if you are using the free version of Oracle BI Publisher. This option enables you to use the basic printing functionality, which includes creating report queries and printing report regions using the default templates provided in Application Express. 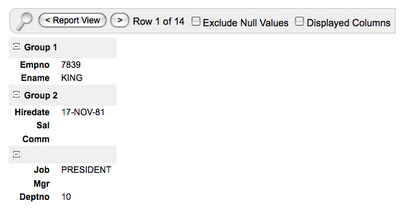 Advanced Support - Select this option if you are using the licensed version of Oracle BI Publisher. This option enables you to take report query results and convert them from XML to RTF format using Oracle BI Publisher. Select this option if you want to upload your own customized RTF or XSL-FO templates for printing reports within Application Express." I didn't notice that before, but if you read it carefully it says "if you are using the free version of Oracle BI Publisher"!? I didn't know there was a free version? Is Oracle going to announce a free version or is it just a mistake in the documentation/help? 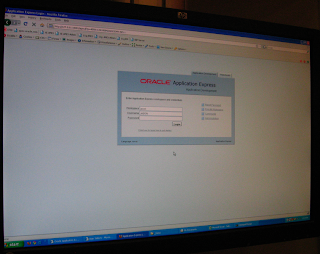 Yesterday a new Patch came out for Oracle Application Express. If you look at the number of fixes I think it's worthwhile to apply the patch. Depending the version of APEX you're running you need to install the full patch or get the patch from Metalink (patch number 7313609). I applied the patch today to some of my systems and it went like a charm. Don't forget to read the Patch Notes before you apply the patch. Two commands to run: "SQL>@apxpatch.sql" and "SQL>@apxldimg.sql /tmp/patch" (if you run with XMLDB) or copying the images directory (if you run with Apache). The patch took just over 3 minutes to finish. John Scott did an excellent post about Bug Number 7298389. He proves that the patch does what it needs to do to minimise the redirects, which hopefully improves our Google ranking of our APEX sites.